We spent our last bit of time in Iceland reflecting on what an incredible experience we've had here and starting to put together connections of everything we've learned. We spent our last bit of time in Iceland reflecting on what an incredible experience we've had here and starting to put together connections of everything we've learned. We were treated to a nice dinner out served by one of the best chef's in Iceland, who makes the world's best chocolate mousse (according to Lonely Planet). Some students snuck in some last minute hiking before we left town. 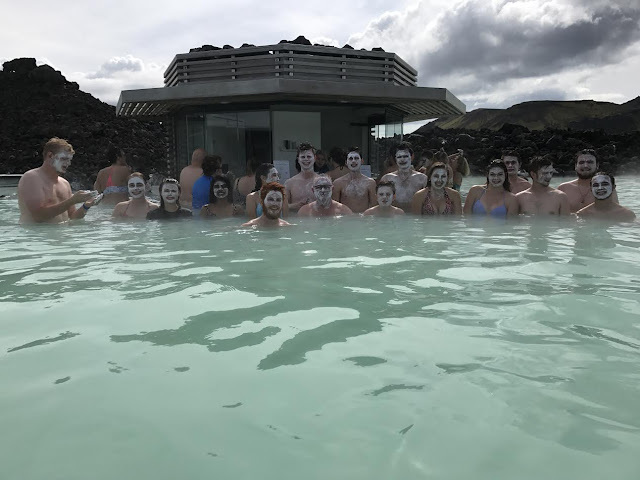 On our way to the airport we made a stop at the Blue Lagoon, a beautiful geothermal spa, which was an amazing way to wrap up the trip. Now that everyone has soft skin from the Blue Lagoon mud masks and are feeling relaxed and refreshed it's time to head back to Minneapolis! Many thanks to all of you who posted blogs. It was great to see the wonderful photos and read the descriptions of your adventures! Our family especially enjoyed being able to see Noah's bright smile in the group photos. :) Welcome back to the USA, everyone!